She took her usual table at the Capital Cappuccino cafe, their titular beverage in hand. She'd been to just about every coffee place in the city, including most of the big franchise locations, but Capital was by far the best, as far as she was concerned. No other place in the region had Capital's clean, comforting look and old-school charm. The front of the store was all glass; not as much of a benefit in the rain as it usually was, but it afforded her a great view of the cars sweeping majestically by the windows as they carried their passengers from one part of the city to the next. The rest of the walls were very plain; hardly a decoration in sight, and numerous pipes were visible, painted to match the wall. The overall impression it gave was of cleanliness, rather than the spartan feel that other places might have suffered. The smell of the coffee was strong, but somehow not overpowering like it was in some places. It greeted you as you walked in, and settled around you like a warm blanket the longer you stayed. The real highlight of the place though was the furniture. It was real, genuine wood, cut and polished with the grain still visible. The golden shine of the wood counter under the hanging lamps had been breathtaking the first time she'd seen it years ago, and it never lost its impact. The chairs were darker, a more reddish brown hue. The tables were surfaced in a more typical blank white. She'd hardly ever seen wooden furniture before setting foot in this place, and took a special joy in sitting in the wooden seats. It was probably her imagination, but she always felt like the seat was just a little warmer than it should be, like the tree it'd been cut from was somehow still alive and warming it just for her. She'd been seated for less than an hour, sipping her cappuccino and scanning the news, when Quinn's details came down the data tubes to her. Easy enough, already here, she wrote back. She glanced at the time; it was 2:30. That was plenty of time to finish her research, and she didn't have to pick up her Gran until 5. She glanced at the time again. 3:05. Hmmm, she thought. He's late again. She was neither surprised nor especially angry; it wasn't uncommon for him. She was anxious though. Wakey wakey, she pinged him. You said 3:00! Just then he walked through the door, checking his phone for her message. She rolled her eyes and smiled. Quinn was a small guy, about average height, but thin and a little spindly. His blonde hair was pale, though not as pale as his skin. It was a slightly shaggy mop on his head. His features were thin, too, but his eyes were laughing as he read her message, and his lips followed suit, quirking into a lopsided grin. He hadn't noticed her; he grabbed one of the small white porcelain mugs and gestured to the server. That was one of the other things she liked about the place, she reflected; actual people doing the serving. It was a novelty; most places were completely automated. She was grateful that at least the payment mechanisms were automated; you just took what you wanted and it was verified and charged automatically, no fuss, no muss, just coffee. Right behind you, she sent just as his espresso was handed over. He took it and glanced at his phone, then turned and caught her eye with a grin. He sat himself down. "Josie! It's been way too long. Your hair's growing out. You going for the longer look?" Ugh, she thought. It was going to be this way, then. He never commented on her hair or anything like that unless he was stalling, trying to drive her crazy. "Thanks. Thought it was time for a change. And speaking of changes, what's the job?" "Oh Jo, always in such a rush ... okay, fine," he said with mock melodrama. "Fine, fine. It's Westall Holdings." Her eyes widened a little in recognition. That was the company Sal's husband David worked at. "Don't get too excited. I know they're pretty big around here, but it's nothing glamorous, like I said. Mail room stuff, maybe some archives, that sort of thing. And it's short term, just a few months. Not huge pay. A buddy of mine knows a guy who works there, he's lookin' for bodies to fill the ranks. They got some kind of big project on the go." She narrowed her eyes at him. "What's the catch? You never give up your teasing this quick." "No catch, we're just late to the game. We've gotta hurry if we're going to get in before the getting's gone." "Couple of days, tops. Can you be ready to go see 'em tomorrow?" Westall Holdings. She didn't know much about them aside from the name, because of David. She could definitely use the cash though. "Tomorrow? No problem. Got nothing else to do." 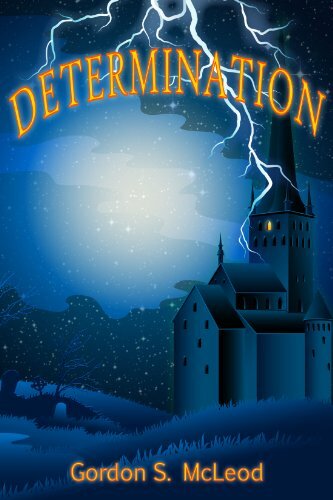 If you're enjoying this story, you might enjoy Determination, available here for free, or maybe you'd like to help support the site by buying it for $0.99 over at Amazon. Either way, hope you keep enjoying my work!